Introduction: During our coverage of ICAST 2005, we shared with you a new swimbait showed to us by Chris Brown of Strike King: the King Kong, a four sectioned, plastic molded bait offered in two different sizes. 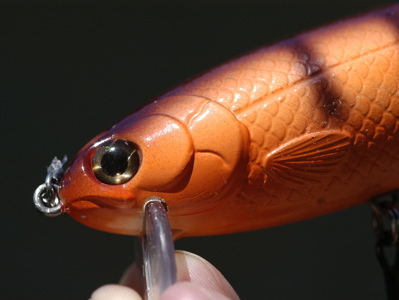 Before ICAST, we acquired an early version of a similar bait by A.B.T. Lure company, the Titan. When we returned from the event and compared notes, we realized the similarities in the two baits and wondered about their origins. A short time later, it was revealed to us, that indeed, they were the very same baits. A.B.T. Lure Company actually produces these baits for Strike King. 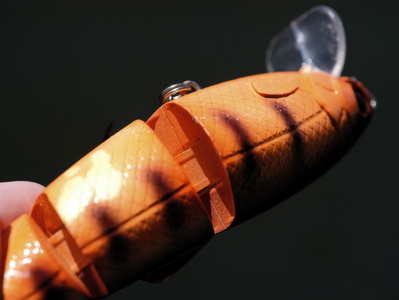 Here then, is our review of the ABT Lure Company's Titan, also known as the Strike King King Kong. Sizes 6" (tested) & 8"
Impressions: Early on, the color palette offered by A.B.T. Lure Company for this bait was a work in progress - changing every couple of months. 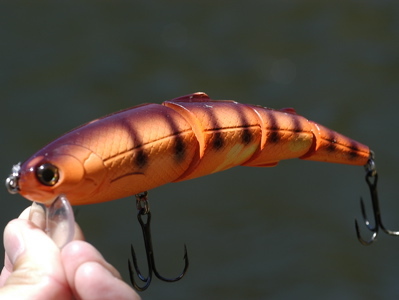 In fact, many of the early colors are no longer offered including that of the lure pictured in this review. What is available now are a total of 15 different patterns: six (6) unique to A.B.T. plus nine (9) unique to Strike King. 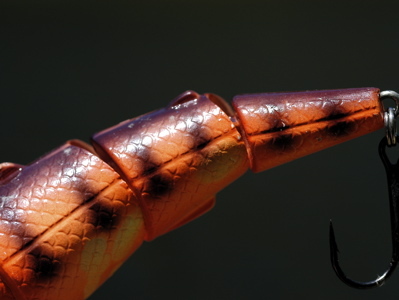 The bait feels solidly constructed and comes with two, large, quality treble hooks. 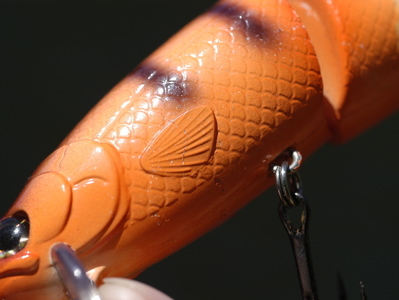 Detailing of these baits while not the most exquisite we've seen is still very good - especially that of the head. The work around the gill plates, forward swim fins and lateral line of the would be fish are most notable. This plastic molded bait is touted as a surface to subsurface bait, so we could not wait to get it out on the water to see what we could scare up from the depths. The Field Tests: our Megabass F7-69DG Mephisto paired with our Conquest 201DC and our Daiwa Heartland Z Hamma Spinnerbait Special paired with our Daiwa Bay Casting Special 103L. Our Conquest 201DC was spooled with 20lb Sunline Shooter FC and our Bay Casting Special with 20lb Berkley Fireline. 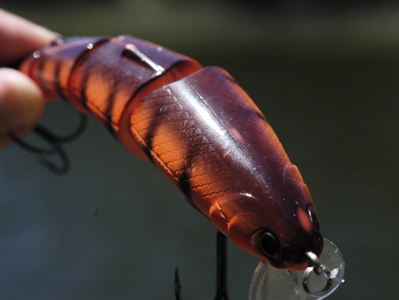 Casting: Presentation of these large baits is certainly an adjustment from standard sized lures. Accurate casts, while possible, are not the norm though it is possible to pitch these baits to gain accuracy. Such was our experience with the A.B.T. Titan. Paired with our two stout rods and smooth casting reels, distance was never a problem either through overhead or sidearm casts. We couldn't help but to be mindful of our surroundings when casting this bait and fortunately, we had no mishaps. Presentation: On a standard retrieve, the ABT Titan swims back to you in a fairly natural appearance. The head section holds relatively still while the tail swings back and forth to the side. 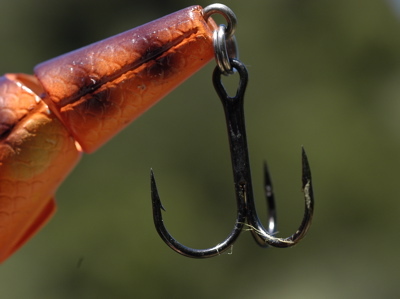 The bait does have a slight wobble, but not to a point where we think it detracts from the bait's action. Retrieved on a herky-jerky cadence, similar to working a jerkbait, the Titan dives and swims very erratically providing a good imitation of an injured or dying fish. It is this last retrieve we found most effective. Trolling: What many anglers like to do with these large, billed swimbaits is to troll them around the lake in search of big bass. This is a rather new technique for us while chasing bass and while we experimented with this presentation, we had no success enticing hits. The Titan/King Kong is relatively easy to troll and I'm sure with some persistence, better success than what we experienced can be had. 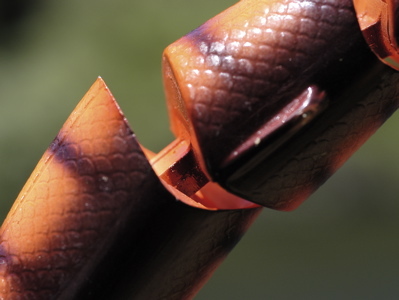 A closeup look of the rear three sections of the bait. Note the subtle fins at the to and bottom of the lure. 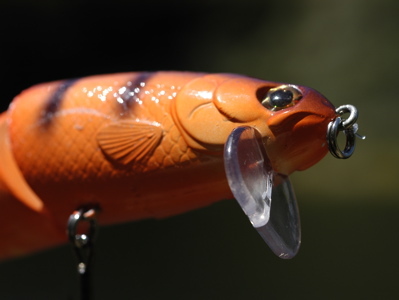 Durability: The hard plastic body of this bait is extremely durable as is the egg shell-like finish of the lure's paint. The hooks and hook and tie attachments to the bait are as solid as they come and we experienced no issues with the three different joints of the bait. 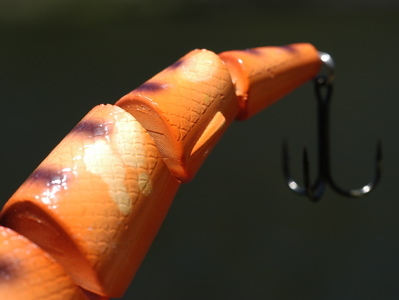 This bait is built to last and we were quite confident throwing it in a variety of situations. Application & Effectiveness: While a fairly versatile bait for its size, and capable of a variety of presentations, we enjoyed fishing this bait most in the herky-jerky ripbait type of retrieve. The lure really seems to come to life in this type of retrieve. Our most memorable encounter was a late spring outing on the California Delta. I cast this bait out along some sparse weed patches adjacent to a rip-rap levee wall. After a significant pause, I made three quick jerks, paused again and WHAM! amidst a huge swirl, my line snapped tight, I swept back and the fight was on with what ended up being a seven pound plus bass - the largest taken on this bait during our tests. Conclusion: If you're looking for a bait to sample in this recent swimbait craze, the Strike King King Kong / A.B.T. Lures Titan, is an excellent choice. You can fish it slowly on a steady retrieve over submerged structure or weed lines, erratically jerk it back to the boat, or troll it as you tour a lake in search of that big bite. The more you fish it, the more confidence it inspires. Because it's not a super high priced lure yet surprisingly durable, it's easier to throw it into areas you might not normally throw a swimbait like up against a rip-rap wall, in the midst of some submerged timber, or in the middle of the nastiest weed patches you can find. The more chances you take, the better your odds are of being surprised by the catch of a lifetime. The King Kong/Titan is worthy this chance.